The stars are out in West Kirby, and it’s all thanks to Smudge Boutique! It seems as though boutique owners Lauren Casey, Alison Dunn, and Carina Walsh have brought back some showbiz sparkle from their recent Hollywood trip, as the shop on Banks Road is now the first stop for those in need of styling. The team at Smudge Boutique have been inviting their online following to read all about their fabulous styling sessions on their blog. ‘Smudge Styles’ is the name of this special online feature. Packed with fashion advice and wardrobe tips, ‘Smudge Styles’ is a brand new online feature that sees a different local celebrity visit the West Kirby shop each week. These glamorous VIP visitors often have a big event fast approaching that requires a show-stopping look – which is where stylist Lauren steps in. In the first instalment of the blog, Lauren styled Juice FM and Bay TV presenter Ellie Phillips in outfit that was ready for the catwalk – The Very Big Catwalk, in fact, which Ellie hosted in July. Other guests to the boutique in recent weeks have included model Holly Henderson, (who recently appeared on brand new E4 show ‘Young, Free, and Single’ in her Smudge Boutique outfit) and television personality Rebeckah Vaughan; fast cementing Smudge Boutique as first choice in fashion for showbiz girls from Merseyside. The women behind this popular Wirral boutique want potential customers to know that not only do they stock fabulous brands- such as Finders Keepers and We Are Handsome, loved by Jessica Alba and Beyonce, but part of their business is offering one on one, free styling sessions. And you don’t have to be a celebrity to book an appointment with the Smudge stylists! In addition to celebs that they style in-store, Smudge Boutique have taken their styling services global; flying to fashion capitals such as LA to dress actresses Katy Sloane and Kate Drew-Jones. 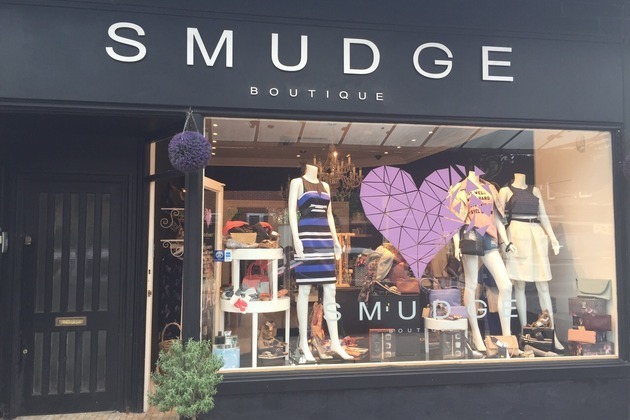 The ‘Smudgettes’ is an affectionate nickname for their loyal customers, and making sure they look good is Smudge Boutique’s main aim. From always keeping their customers interests in mind when selecting brands, to styling them head to toe and leaving them feeling happy and confident with their look, everyone that shops with in store, or online, is treated like a star. Whether they need an outfit for the races, or a television appearance – the team behind Smudge Boutique are providing Merseyside women a shopping experience with that extra sparkle. Visit www.smudgeboutique.com to shop online or read their blog. Visit their West Kirby shop on 86 Banks Road, CH48 0RE. Follow on Twitter at @SmudgeBoutique.